On late winter afternoons Keoladeo National Park in Bharatpur looks beautiful and calm. It is a lovely time to be outside, watching shadows lengthen slowly over still waters. The Family scanned the surroundings; she’s very good at spotting hidden birds. I am visually lazier, looking at open spaces, attention on obvious things like that huge tree jutting out of a little islet in the pond. I wondered whether the tree created the islet or it sprouted on an already existing mound. The green moss on the blue water looked nice, so I raised my camera to take a photo. One edge of the island was crowded with Common Coot (Fulica atra), which are highly visible winter migrants because of their distinctive white bills. You can see them in flocks like this, or paddling singly or in pairs in ponds across India in this season. It seems that they are extremely territorial and aggressive in their breeding range in the northern latitudes, so I find it a puzzle that they flock together like this while they winter in India. The answer, it seems, is in the cost of vigilance. Watching out for predators takes time away from other activities. Many eyes watching out would improve the ability of flocks to feed better, even with more competition for food due to flocking at the same place. The island also had other birds; you can see a Watercock (Gallicrex cinerea) near the edge of the frame. At this time of the afternoon the birds are quite active, probably getting a large meal before settling in for the night. I tried to get extreme close ups, but the level of activity was so high that the birds kept disappearing under water leaving only large splashes on the surface. 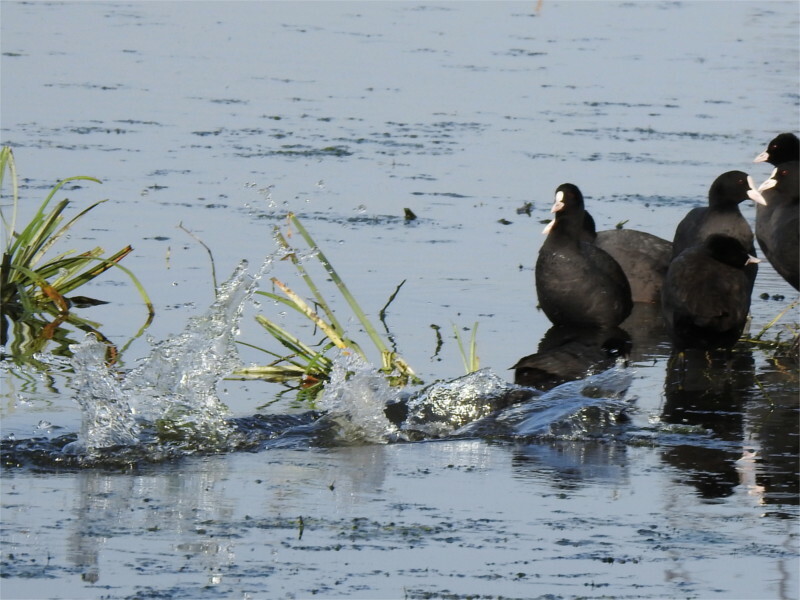 I’ve often seen long leaves hanging from the bills of coots when they come up again. It seems that they feed on leaves and seeds more often than on invertebrates. When I found this I wondered whether they can be as bad as some more common herbivores, which can denude a landscape if their numbers increase. Very often, when you ask a question someone else has asked it before. So I could get an immediate answer: no. Good to know that this abundant and un-endangered bird is not the cause of the disappearance of other species. You can say that in this respect they are pleasantly inhuman. 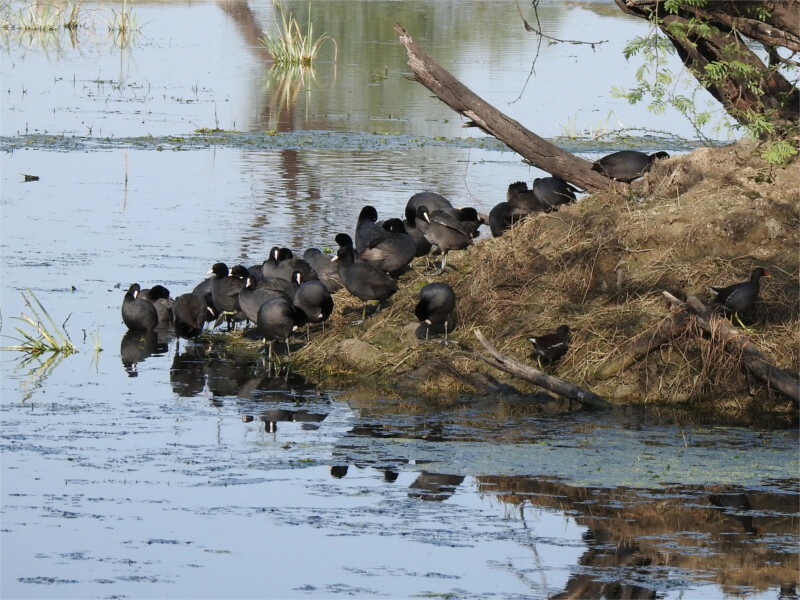 Author I. J. KhanewalaPosted on April 17, 2019 April 18, 2019 Categories India, WildlifeTags Bharatpur, Common Coot, Fulica atra, Gallicrex cinerea, Keoladeo National Park, Rajasthan, Watercock2 Comments on Splash! Whose ghost was it that Ram Singh (the Savoy bartender) saw last night? 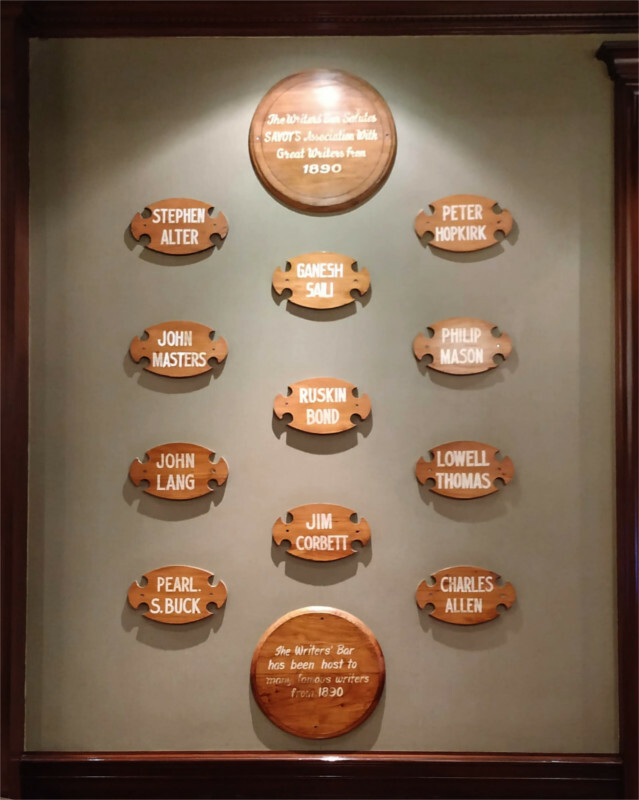 A figure in a long black cloak, who stood for a few moments in the hotel’s dimly lit vestibule, and then moved into the shadows of the old lounge. 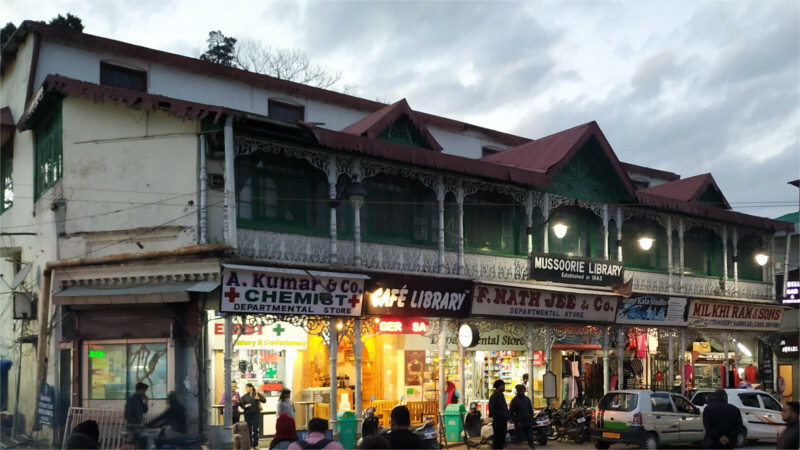 Mussoorie is a haunted town, as you would know if you ever read books by its most famous living resident- Ruskin Bond. I’d decided to make his stories my guide during our brief stop over in his town. 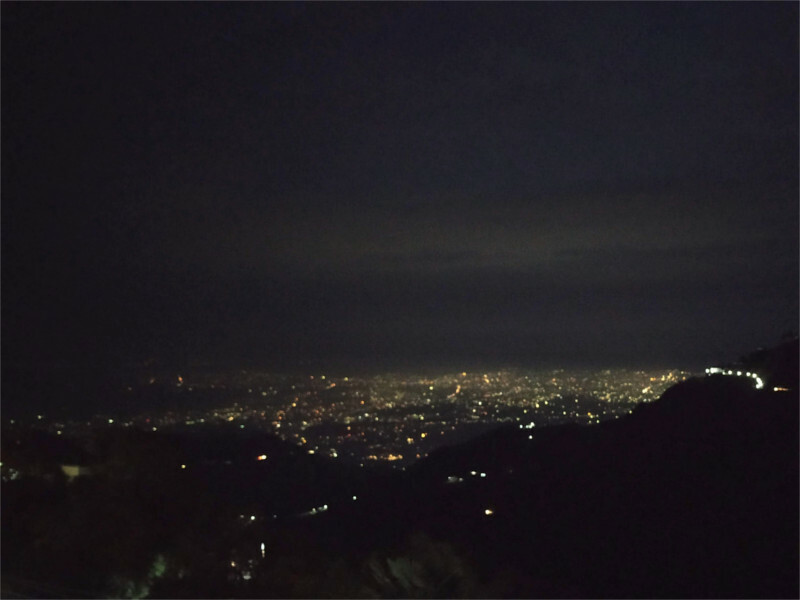 Accordingly, we walked down Mall Road in the evening, to stop and admire the view of Dehradun spread out below us. 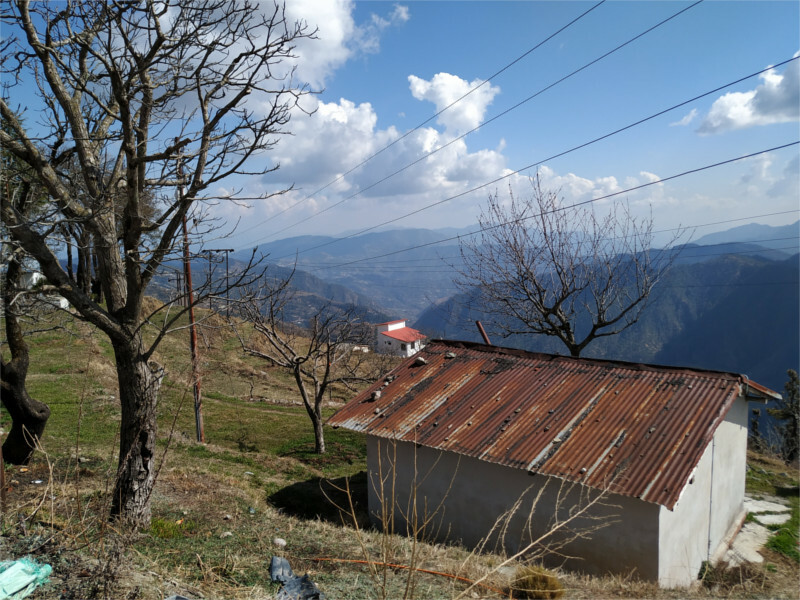 These towns are relics of the British Empire, whose administrators fled to the hills as soon as winter Marched out. 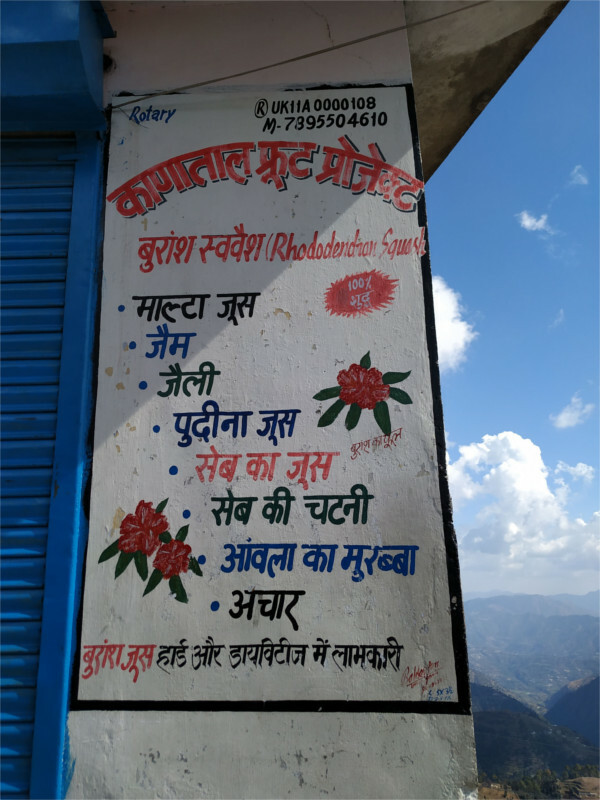 The phrase “Hill Station” for these once-charming little towns dotted across the lower heights of India are clearly a colonial joke (“Which station are you at, old chap?”, “A hill station you know. Taking a bit of rest.”). What did the English like about these places? Apart from the temperature, it must have been the upredictability of the weather. The day had been nice as we drove up from the valley, but now clouds were gathering. 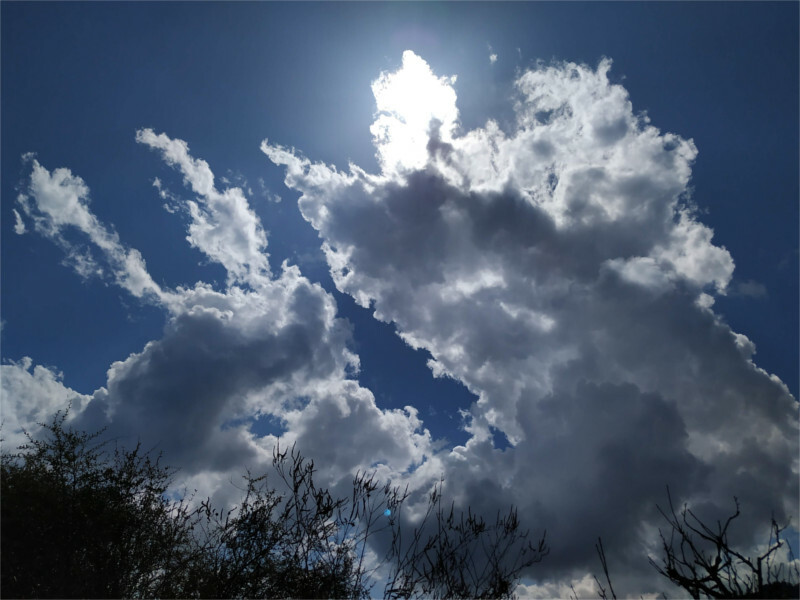 There was to be a brief hailstorm the next evening. But right now the weather was pleasant. We decided to walk on to the Savoy and its storied Writer’s Bar, where the ghosts of Mussoorie gather for their evening’s tipple. A lot of people who enter the Writer’s Bar look pretty far gone, and sometimes I have difficulty distinguishing the living from the dead. But the real ghosts are those who manage to slip away without paying for their drinks. Charles Dickens wrote an account of Mussoorie’s social whirl in a piece called The Himalaya Club which appeared in print in 1857. I counted that would have been three days short of 162 years ago when we walked into the bar. It was off season. A young couple sat in one corner gazing at each other, far away from a group of men talking on their phones more often than to each other. As a result, the bartender and a couple of other servers hovered around us and plied us with conversation and drinks. 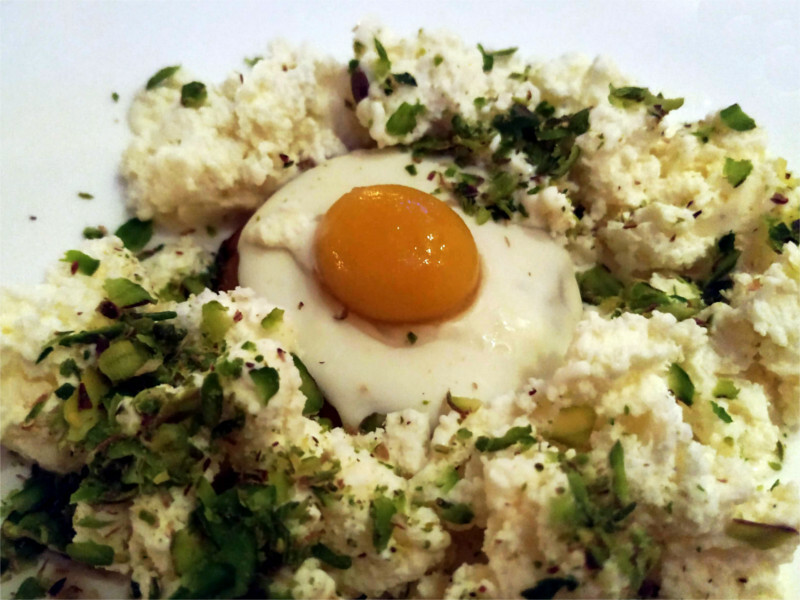 (Their special cocktails are a treat, and should not be missed if you are in town.) “Has anyone seen McClintock’s ghost recently?” I asked. I was told that the rooms we sat in once had a piano which was haunted by the said ghost. “But it has been sold off,” the Maitre told me. “But you can still hear the piano sometimes”, one of his platoon said in counterpoint. After a perfect evening of interesting drinks and food, we were taken on a tour of the Savoy. 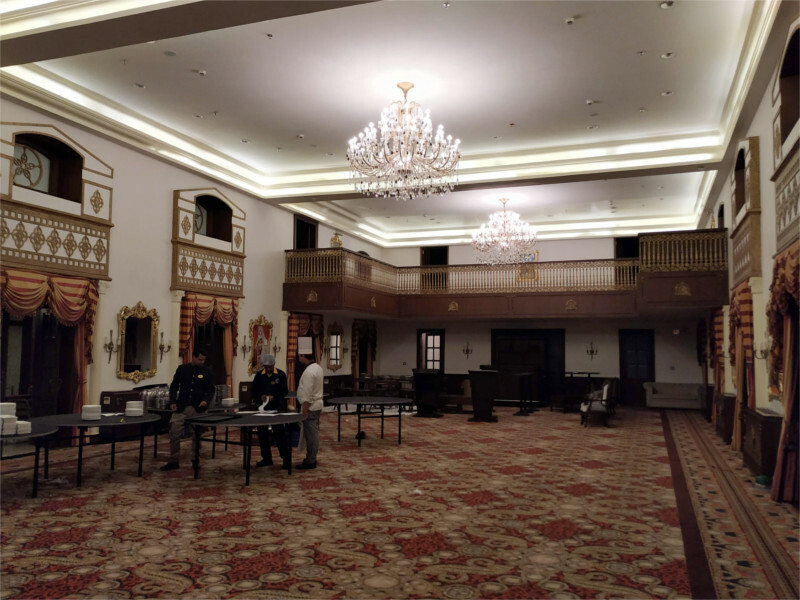 One major stop was the grand ballroom where, in 1952, the film star Nutan was crowned Miss India. 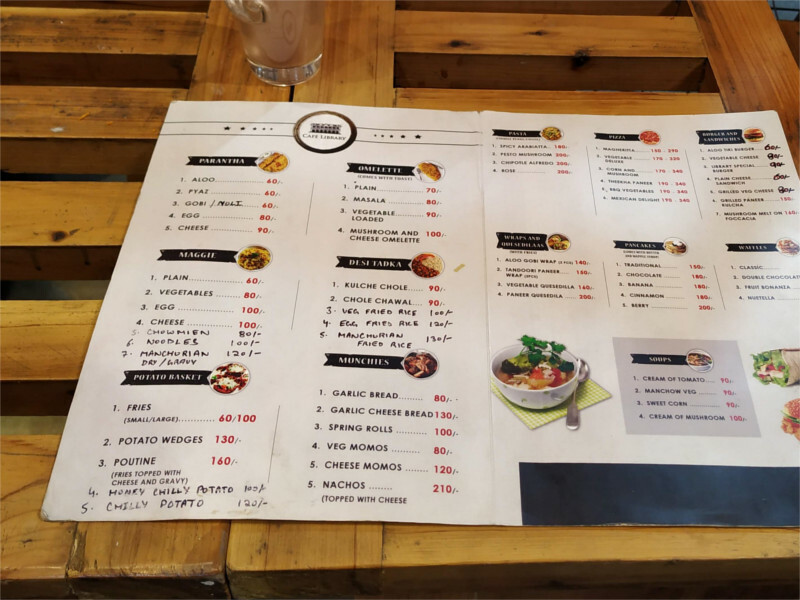 There was some pride in the Maitre’s voice as he said this was the first time a Miss India had been selected. This is almost true, says Wikipedia; you have to discount only the pageant in 1947 held in Calcutta, but that’s easy, because that was before independence. After a walk through the rambling old building, extensively added to in recent years, the Maitre got a hotel car to drop us off at the Library Bazaar. By now the bazaar had shut down. It had got a little chilly, and it was dinner time. Reason enough for the few off-season tourists to have disappeared. 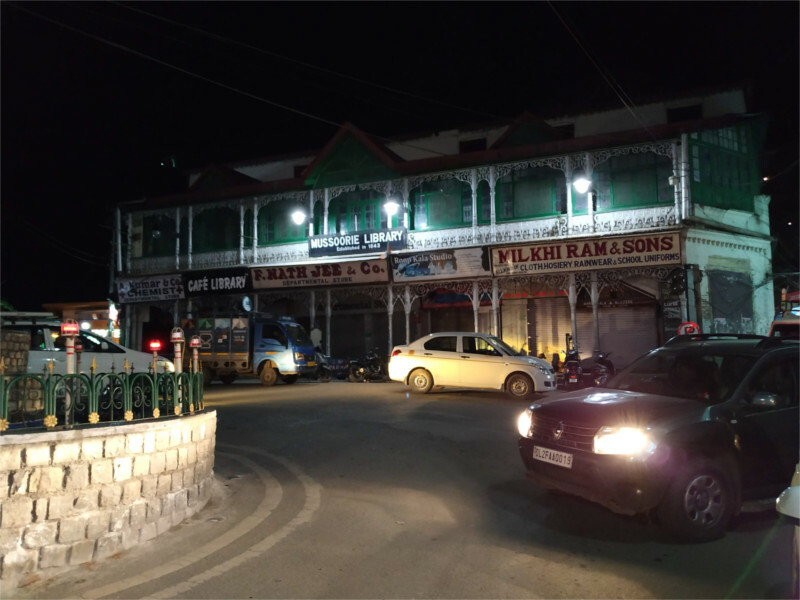 The square was lit up by the headlights of passing cars. I liked that atmosphere; it looked like the ghosts of the past could stroll by us in that bad light. 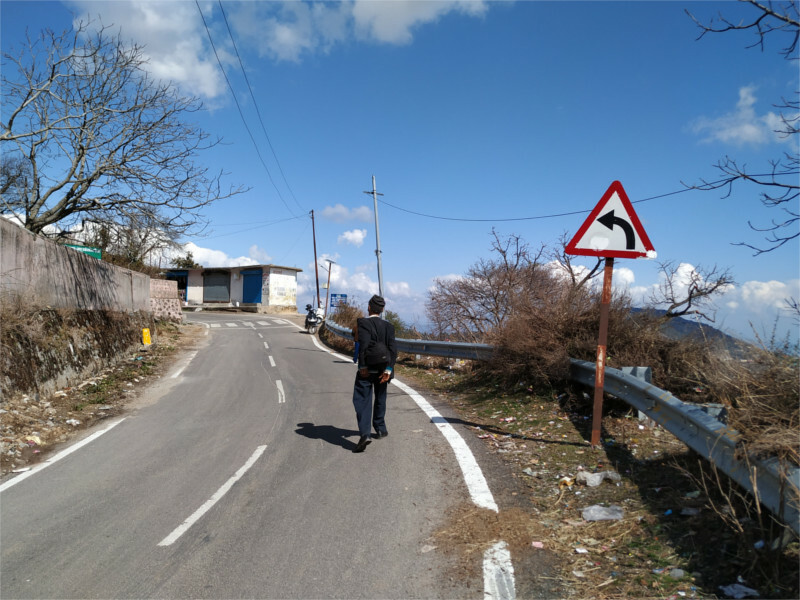 Mussoorie lives with the ghosts of better days, even as, like all the old hill stations, its once charming center slowly sinks into the swamp of cheap hotels. Of the three different kinds of Ibis you can see see in India, the one I’m most familiar is the Black-headed Ibis (Threskiornis melanocephalus), which inhabits the tidal marshlands around Mumbai. That’s why it was nice to visit the Keoladeo National Park in Bharatpur where I could see all three kinds present in India (there are 28 different species of Ibis in the world!). This is not the breeding season for any of them, so the adult birds which you see here are in their non-breeding plumage. The Black-headed Ibis in the featured photo stood out of the marsh-land vegetation which it sat on. I watched as it groomed itself carefully. The breeding populations of this bird are mainly in India, although migrants are found in various parts of Asia, including a population as far north as Manchuria. In spite of its distribution, the worldwide population is decreasing, and the bird is now classed as near-threatened. 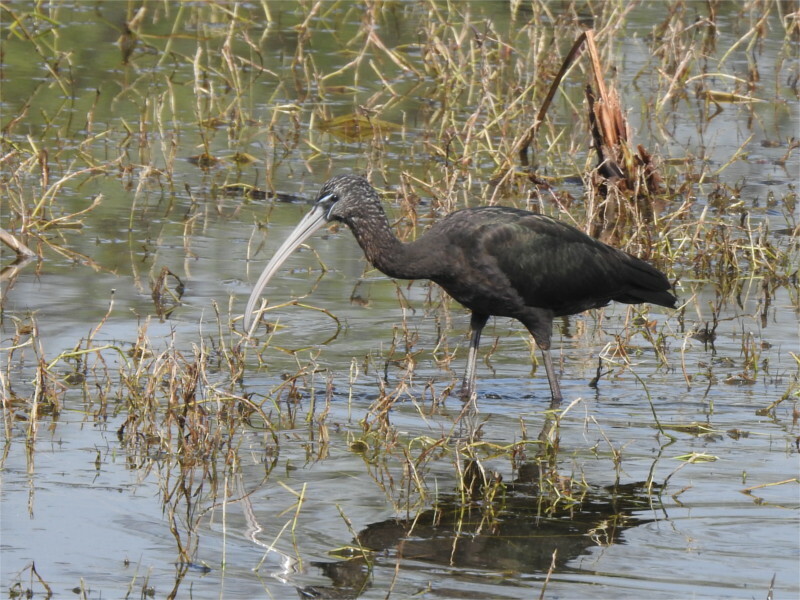 Nearby, a Glossy Ibis (Plegadis falcinellus) poked around in the shallow waters, looking for food. These birds mainly breed over most of Africa, but are extensive migrants to India, and can be found also in parts of the Middle East, Central Asia and Southern Europe. They are unlikely to be fussy eaters, and probably feed on different molluscs and insects when they travel. A study in Spain, where a breeding colony has recently been established, found that during the non-breeding season they poke around in paddy fields and eat waste rice. 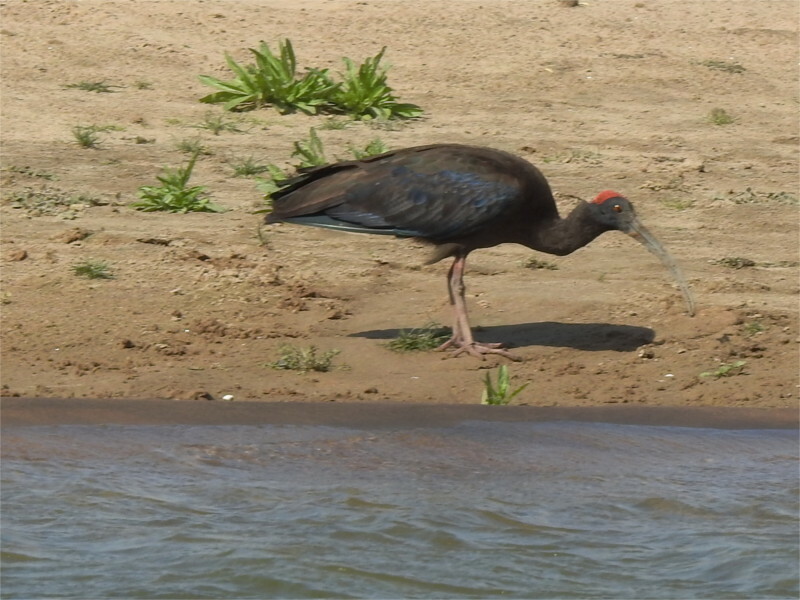 I came across this Red-naped Ibis (Pseudibis papillosa) on a visit to the nearby Chambal Bio-reserve, and took this photo from a passing boat. The curved bills of Ibis are used to feel out the mud under water to find food, so they are called tactile foragers. Red-naped Ibis breed only in India, and do not seem to be reported outside this geographical area. 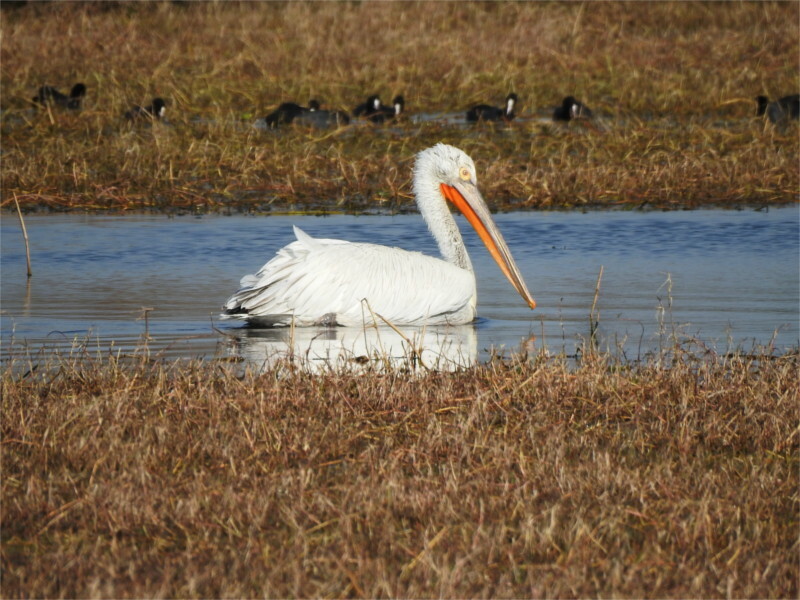 With constant degradation of wetlands, they are now found in all kinds of microhabitats, waste water and garbage dumps, as often as their natural habitats of fresh-water wetlands and grassland. If Ibis Ibis and Ibis were a law firm, I’m almost certain they would sue us for muscling in on their living space. We walked out of the Star Chamber of the Chhatrapati Shivaji Maharaj Terminus (CSMT to all of us time-starved people) to admire the decorations outside. 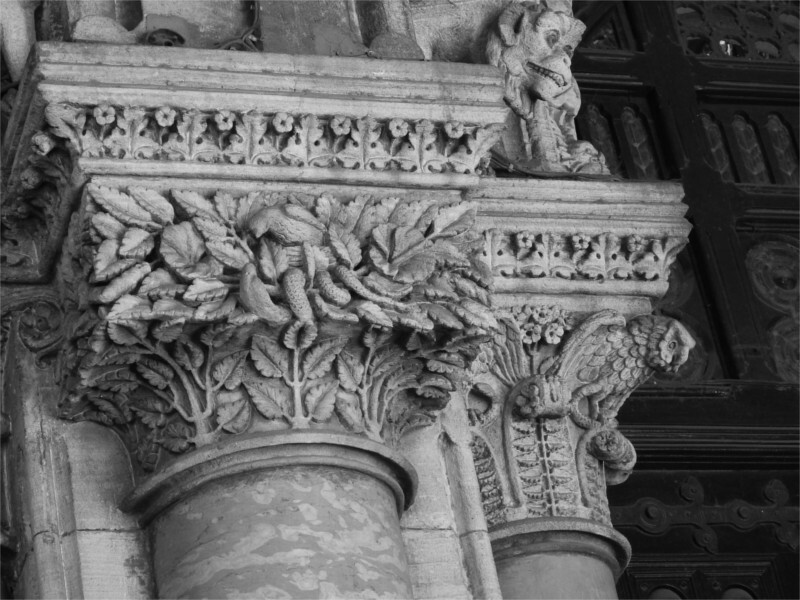 When you look up at the capitals of the columns around the station, you see a veritable jungle. The monkey in the featured photo seems to have been startled by the camera peering at it. The rough chiselling of the stone probably shows that a very large amount of stone carving had to be finished in a short time. The artistic innovation is delightful: the texture of the animal’s fur is evoked by the chisel marks. Inside the ticketing office I’d admired this panel where two mongooses faced off against each other between swirls of Attic vines. Dear Rudyard, east and west do meet, again and again, to produce such wonderful works as these, just a few steps from your childhood home. I looked up at the tower at this corner of the building. There was a whole line of heraldic devices carved into the stone. They included the cross of the Great Indian Peninsular Railways, compasses for navigation, a sailing ship, animals, a cherub and a steam locomotive. Very much a high-Victorian mish mash of symbols. The Family and I looked up at the beautiful facade where four colours of stone are harmonized. This reminded me faintly of Mughal monuments. The jali also seems to be inspired by the similar structures. Looking up further, we spotted a very decorative peacock above an open window. On closer look I was quite taken aback. 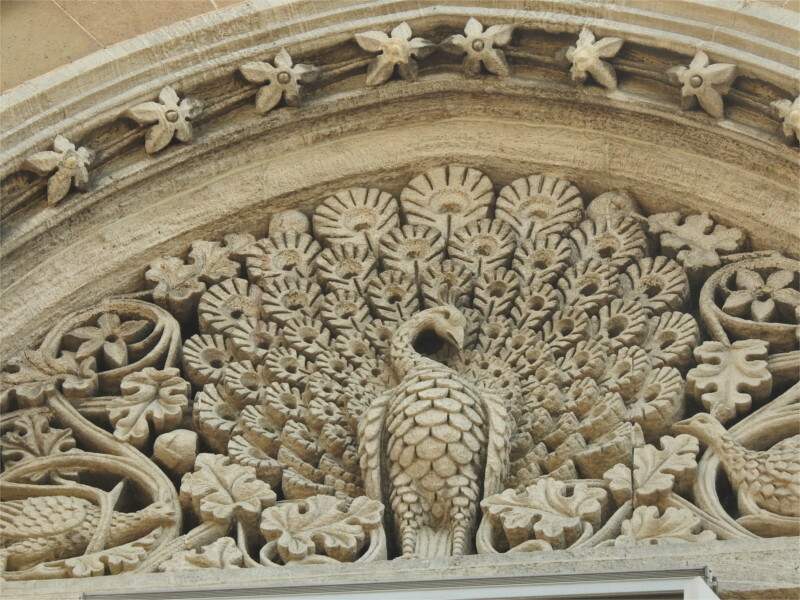 It is hard to capture a peacock in stone, since its main attraction is the shimmer of colour in the male’s raised plumage. 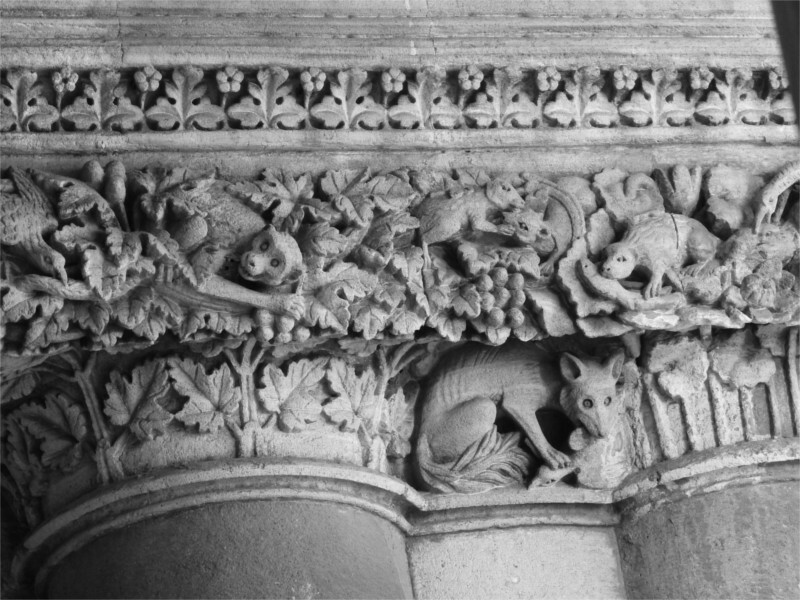 The artist has done a rather good job of capturing the general idea in monochrome stone. Closer above our head I admired owls and sundry birds, dense foliage below the paws of a stone lion about to leap on to unsuspecting passers-by. Below the owl I admired a line of ferns, their delicate leaves and spirally unfolding fronds giving the owl a perfect toe-hold. The foliage in this jungle on the pavement is so completely different from that inside the ticketing hall that I found it useful to compare the two. Inside, animals from an Indian jungle cavort through this southern European flora. Outside, the\ese vines are often relegated to the edges of decorations, when an Indian jungle takes over the main pictorial space. But not always. 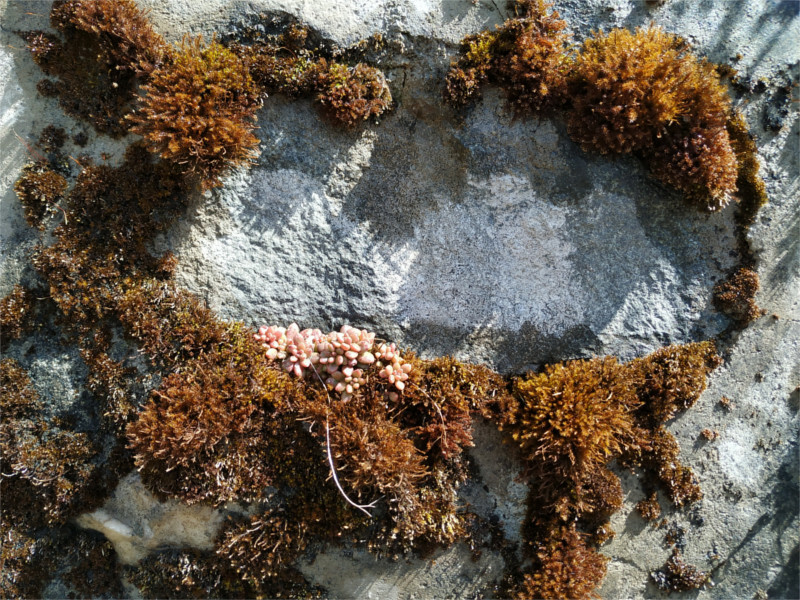 In the panel you see above, eastern fauna meets western flora again. Artists will mash up what they have spent years perfecting. That’s part of the reason I think that the work of decoration was done by students of the J. J. School of Arts and not by local artisans. The repertoire of classical western decorative motifs would not be available to Indian artists who had not studied them. 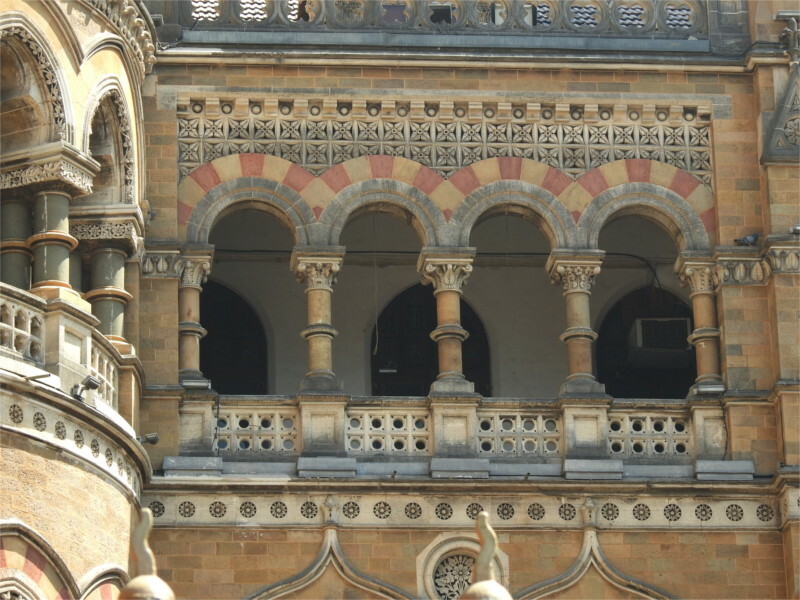 Outside, I took a closer look at the part of the structure which holds the offices of the Central Railways. This part of the building has been restored, and it is possible to visit during office hours. We will have to go back to see it from inside. Victorian Gothic you say? Where are the gargoyles then? You have to look far up, where they jut out of the turrets, puctuating the sky, looking down on the huge stone lions holding steel banners to the wind. Things look different when you point a camera at them. 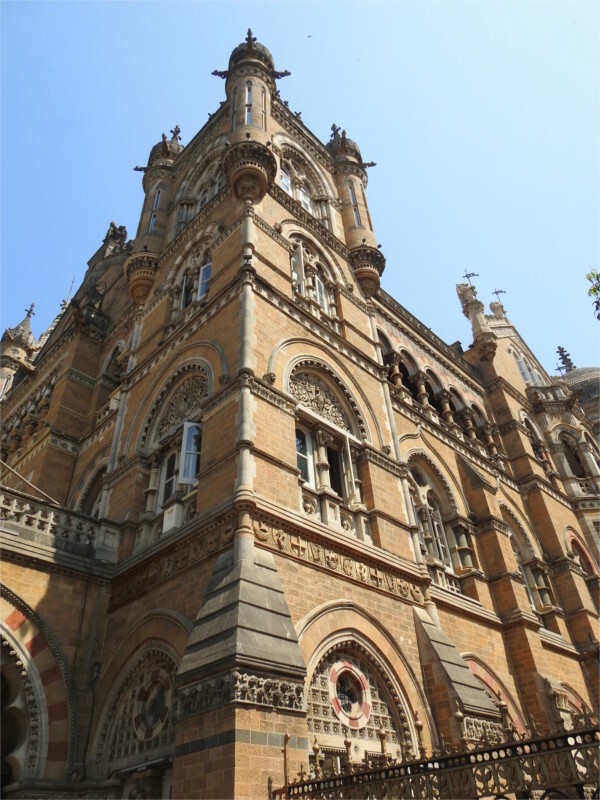 I can’t count the number of times I’ve passed through the ticketing office of the downtown station of central railways, the one called the Chhatrapati Shivaji Maharaj Terminus now and called Victoria Terminus when it was opened in 1853. 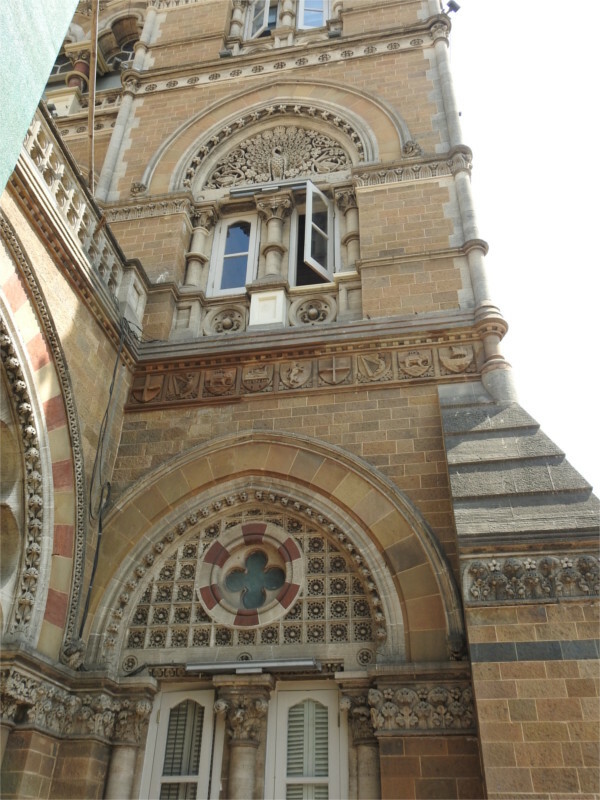 Imagined as an Indian palace in the then-current Gothic Revival style by its architect, Frederick William Stevens, the building took ten years to complete. It doesn’t seem long by today’s relaxed standards, but then it was cause for many agonized letters to editors of newspapers. The featured photo shows the recently restored ceiling of the suburban ticket counter. 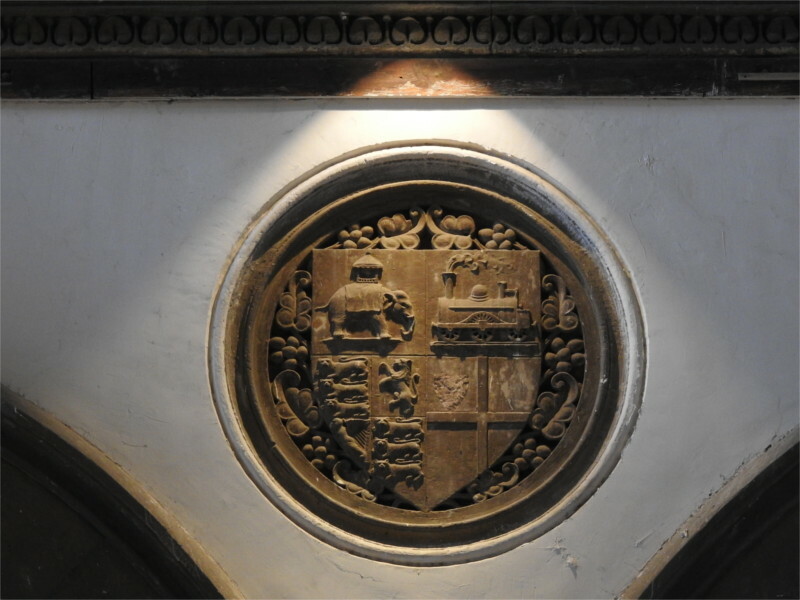 The odd heraldic bearing that you can see in the photo here caught my attention. Could it belong to the company which built this station, the Great Indian Peninsular Railways? Apparently not. The lower half of the shield makes up the complete arms of the company (a further inscribed shield into the upper left quadrant of the cross has been chiselled away). The upper half of this strange device, the railway and the steam locomotive, threw me. Could it be the bearing of the terminus building? I’m sure someone out there has the answer. The station is aligned north-south and the ticketing counters are to the east of the road passing in front of it. 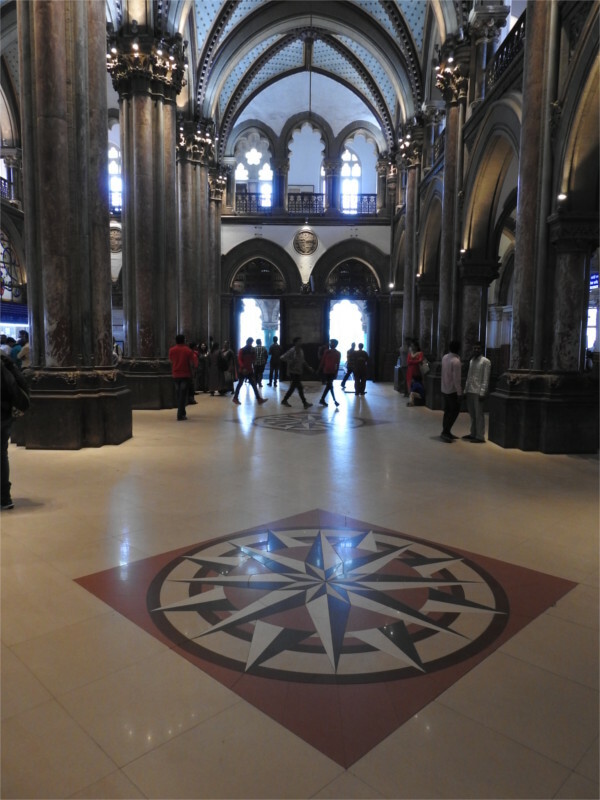 Just in case you are lost, you could orient yourself by the compass roses in the floor of the hall. The Family and I had walked into this place on a Sunday to avoid the massive crowds which we would have found otherwise. We’d wanted to explore the restored building, but found that it is open to visitors only during working hours of the week. As a result we explored this part of the structure, both familiar through long use, and unfamiliar because we usually hurry through it without looking. 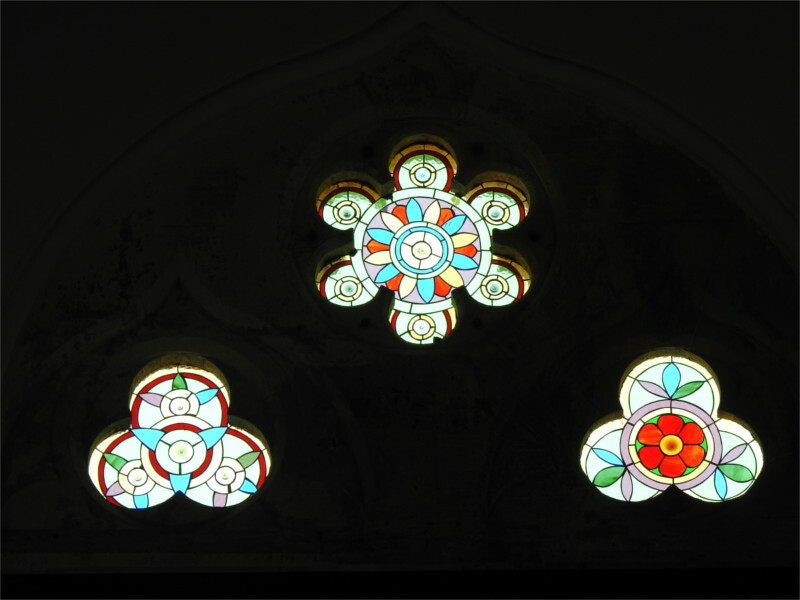 The stained glass windows, in particular, are not things we have paid attention to. Nor did I know that this was called the Star Chamber, and that the marble used here was shipped from Italy. The building was renovated in 1888, on the occasion of the golden jubilee of the coronation of the British queen after whom this station was then named. I couldn’t find a record of who made the stained glass. However, since much of the ornamentation of the structure was done by the faculty and students of the Jamsetjee Jeejeebhoy School of Arts, it could be that the glass is also due to them. There are some pieces here well worth one’s time. 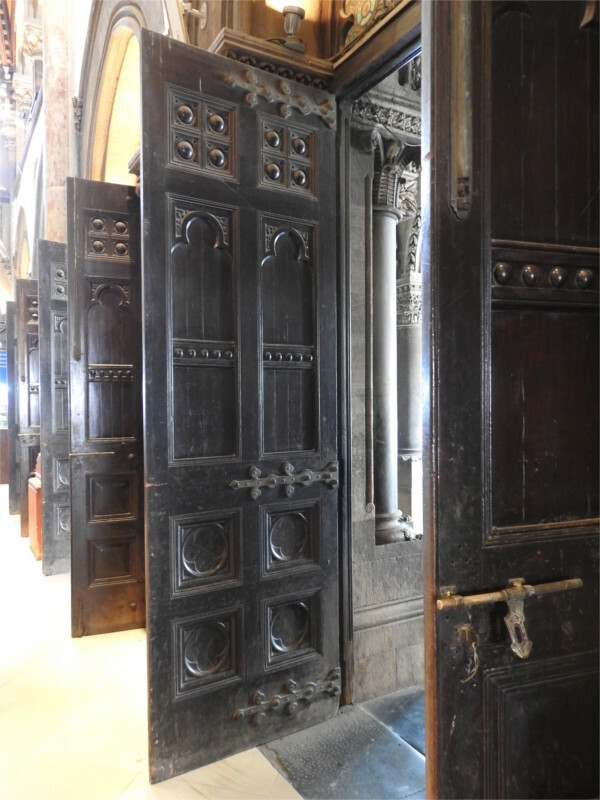 The doors are not grand, but in keeping with the place, they are ornate. I’m not sure whether the ones that you see here are original or whether they have been replaced. Unfortunately I hadn’t taken photos before the restoration, so I can’t check now. 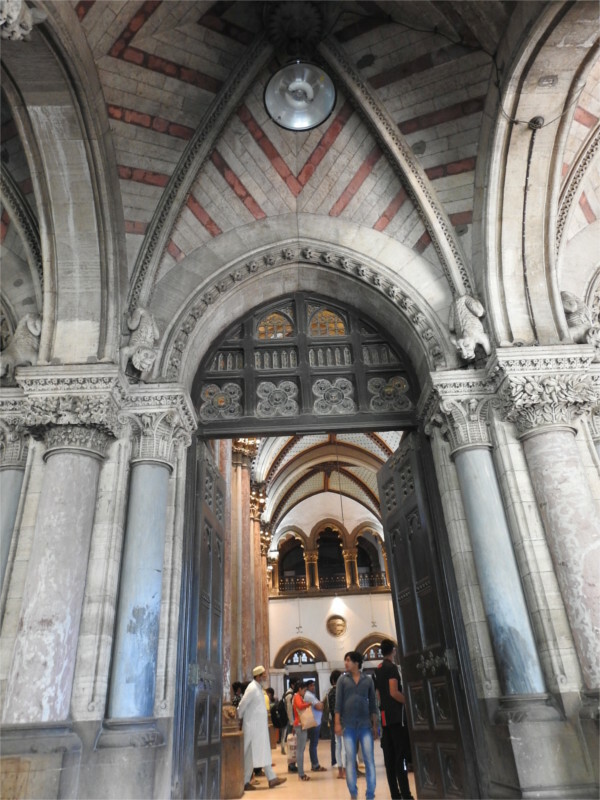 Maybe one should take photos of the doors of historic public buildings every ten years or so. It would be an interesting project. As we exited to the pavement outside, I took one last shot of the interior. I’ve tried many times to imagine the events of 26 November, 2008, when two armed terrorists entered the station from the north and killed 58 people. Panicked commuters ran away from them, and many would have exited through these doors. They are always open. No, definitely not Monty. 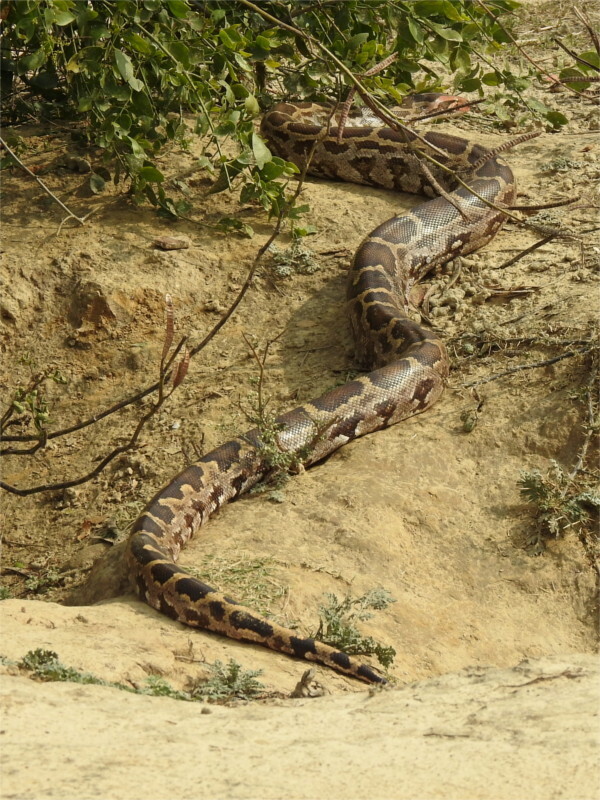 The large snakes that I saw in Keoladeo National Park were the non-venomous Indian Rock Python (Python molurus). There was quite a population of them around. I was most surprised by the one up in a tree. Had it gone up there to look for nesting birds? Apparently they’ll eat any animal, but have a slight preference for mammals. Perhaps because you can eat mammals without having to climb trees or fly. They are practically comatose after a meal. We saw one at the side of a road. It looked dead, but after some time it moved slightly. Only then I realized that there was a bulge a little way below its jaws, meaning it had just eaten. 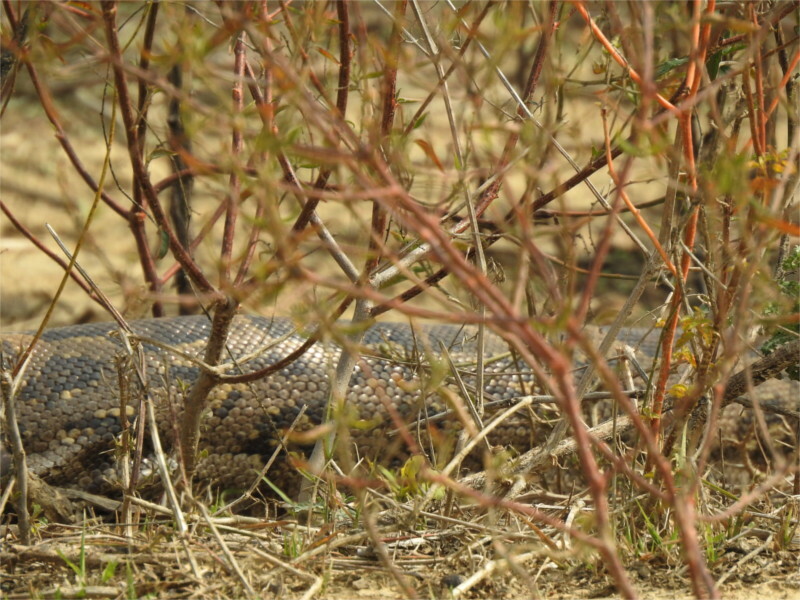 Elsewhere I saw one slowly emerge from a burrow (they are known to take over abandoned burrows of other animals) and crawl away towards a thicket. It moved very slowly, and with only minor undulations. This was a large animal, easily half again as tall as me, so likely to be an adult. They lack eardrums, so we could talk as much as we wanted without disturbing the animal. However, they feel vibrations through the ground, and therefore are sensitive to movements. The fact that this one crawled away from us could mean that it had detected our footsteps or impatient shuffling. They are quite shy, and will try to flee if approached. Interestingly, someone has studied their social behaviour. it was found that the males have a simple dominance hierarchy with different individuals strictly ranked. Social hierarchies are used by many animals to defend territory or mating rights, often without actually fighting. Some time ago I’d seen two male nilgai establish a hierarchy without any contact. Apparently pythons are less adept at such conflict avoidance, and have to fight to establish dominance. Given how few there are, it is something that I don’t think I’ll ever see. Pythons branched away from other snakes about a 150 million years ago, but share with many other snakes the ability to sense infrared using something called a pit organ (you can see it in the two photos of python heads above). 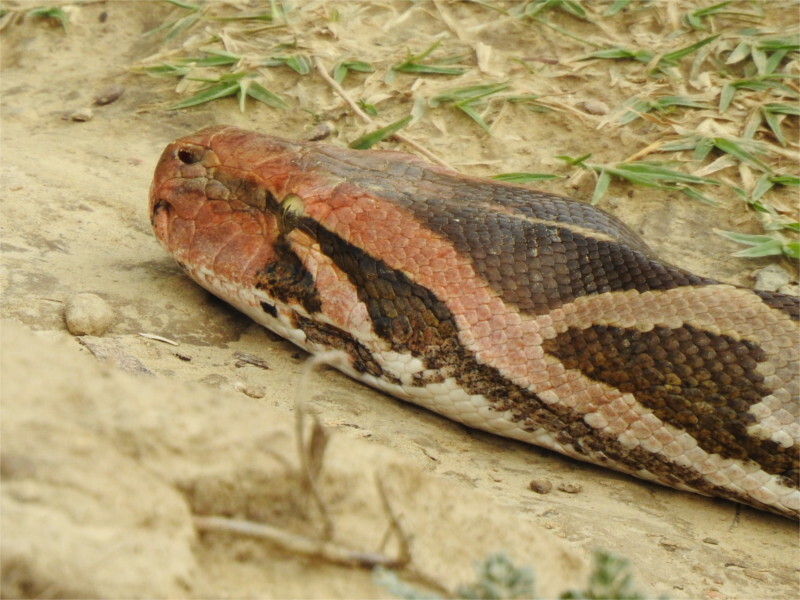 What sets the rock python apart from its other cold-blooded cousins is that the female can control its body temperature when incubating eggs. A classic study found that it does so by rhythmic contraction of muscles to generate heat. These fascinating creatures are now classed as near threatened by IUCN, which means that it is slowly being squeezed out of existence by our need for space. How many more human generations will see them before they go the way of the dodo?